Hyperemesis gravidarum refers to persistent and severe vomiting during pregnancy, which leads to weight loss, dehydration and electrolyte imbalances. It affects 0.3 – 3.6% of pregnant women, and is one of the more common reasons for hospital admission during pregnancy. In this article, we shall look at risk factors, clinical features and management of hyperemesis gravidarum. Nausea and vomiting of pregnancy (NVP) normally starts between 4 and 7 weeks’ gestation. It reaches a peak in the 9th week, and settles by week 20 in 90% of women. It is thought to be due rapidly increasing levels of beta human chorionic gonadotrophin (hCG) hormone, which is released by the placenta. High hCG stimulates the chemoreceptor trigger zone in the brainstem, which feeds into the vomiting centre of the brain. Various other aetiological factors have also been proposed; including genetics, immunological and biosocial components. 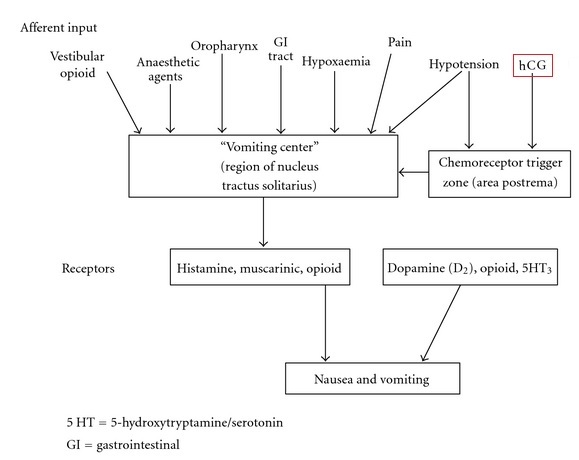 Fig 1 – The vomiting pathway. High levels of bHCG are thought to stimulate the chemoreceptor trigger zone. The assessment of any nausea and vomiting in pregnancy should be made through history, examination and appropriate investigations. An objective scoring system can be used to classify the severity, for example the Pregnancy-Unique Quantification of Emesis (PUQE) score; a score of 6 correlates to mild NVP, 7-12 moderate and 13-15 severe. The investigations in nausea and vomiting or hyperemesis gravidarum can be divided into bedside tests, laboratory tests and imaging. Electrolyte levels are particularly important to monitor; as deranged levels are a hallmark of hyperemesis gravidarum. Ultrasound scan: confirm viability, confirm gestation, exclude multiple pregnancy and trophoblastic disease. 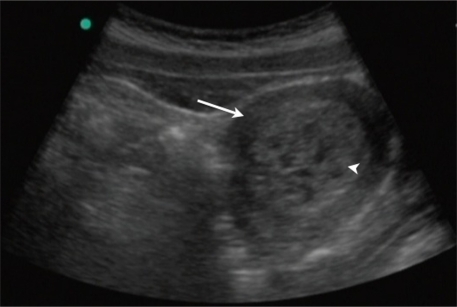 Fig 2 – A transabdominal ultrasound of the pelvis revealing a uterus (arrow) with multiple cystic areas within an enlarged echogenic endometrial cavity (arrowhead). This is consistent with a molar pregnancy. Mild – should be managed in the community with oral antiemetics, oral hydration, dietary advice and reassurance. Moderate (or cases where community management has failed) – should be managed with ambulatory daycare. This involves IV fluids, parenteral antiemetics and thiamine. The patient should be managed until ketonuria resolves. The recommended antiemetic therapies are shown in the box below. A combination of therapies should be used if there is no response to a single therapy. IV rehydration should be with 0.9% saline. Potassium chloride should be added as guided by electrolyte monitoring. The diagnosis is made via history, examination and investigation. Which trimester of pregnancy does hyperemesis gravidarum usually peak in? Hyperemesis gravidarum is thought to be due to increased levels of which hormone? Which of the following is NOT thought to be a risk factor for hyperemesis gravidarum? Which of the following medications has NO role in the management of hyperemesis gravidarum? What is third line therapy for hyperemesis gravidarum?